In my last post, we looked at the process of painting miniatures, mainly concerning ourselves with the mindset you need to develop (it won’t be perfect, and that’s okay) and some of the basic supplies needed to get started. 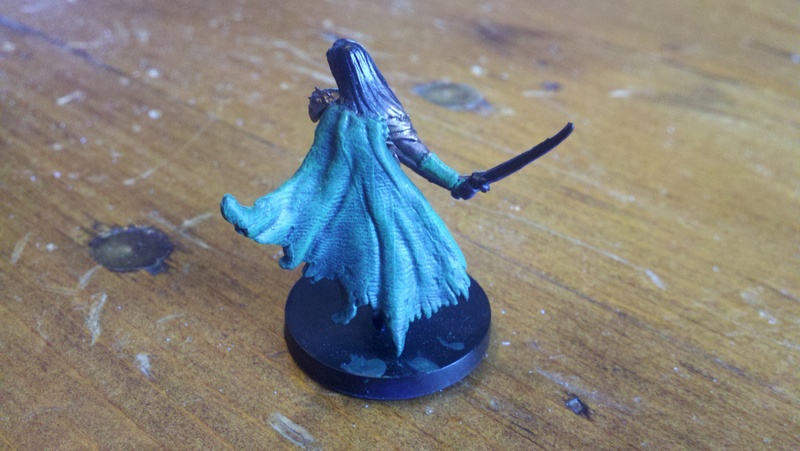 Today, I’ve got a tutorial for painting a Castle Ravenloft miniature, the ranger hero, covering priming your mini and methods for base coating and dry brushing. 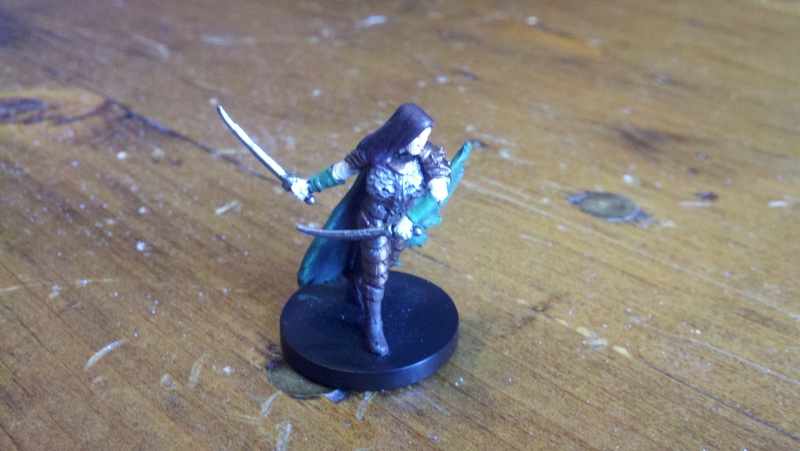 Remember my disclaimer from last time: I am by no means an expert, and my minis aren’t perfect. 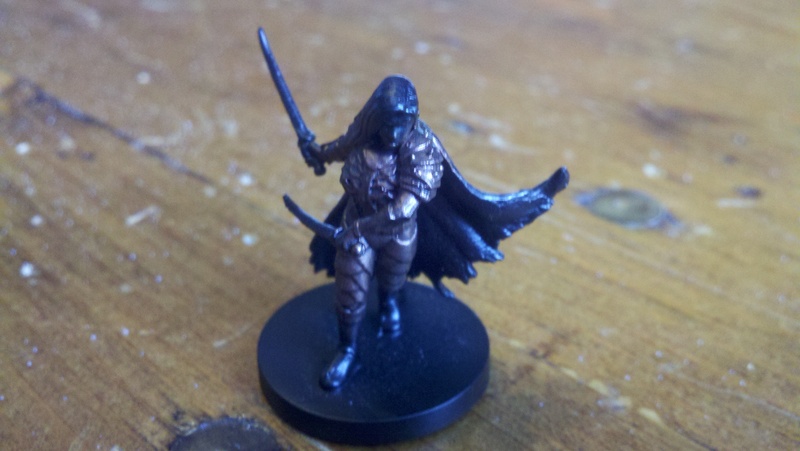 I wanted them to compare to the prepainted D&D and Dungeon Command minis, and for the most part I think they do. If that’s acceptable to you, read on. The first step is to use primer on your mini. It’s a good idea to carefully wash your mini in soap and water and let it dry before priming. There may be leftover dirt or oil from play or even the manufacturing process, and these can interfere with the paint job. I use masking tape to attach minis to a piece of cardboard, which I then take outside for priming and drying. Do be careful about the temperature when you prime outside: consult the can for more information. Use light bursts of primer, from a distance of about six to eight inches. Spray from all directions to ensure even coverage. However, don’t use too much primer, or the mini will lose detail. The mini should dry for an hour or so minimum before painting. There are always parts of the mini that do not get coated with primer, like armpits, the bottoms of legs, etc. It’s a good idea to paint these areas first to get a solid color to build on. I always use black paint, thinned down with several drops of water, to paint these unprimed areas. Next up is dry brushing. A good practice is to dry brush the mini first, because dry brushing is very messy and you will get paint into other areas than what you’d like. By painting this way first, you can simply paint over the sloppy parts later. Dry brushing is quite different than standard painting. Put a small amount of paint onto a brush, then wipe the brush back and forth on a napkin or paper towel until most of the paint is gone. It should look dry, not wet, thus, the name of the method. You’ll think the color won’t show up, but it will, trust me. With your paint brush loaded with dry paint, press the bristles down with a good bit of force on the area you want to paint, and swipe back and forth. Do this vigorously, in order to get the almost-dry paint to cover the raised areas. In this case, the purpose of the dry brush was to bring out the detail in the scale armor that the ranger is wearing. I used copper paint, as I wanted a brown and green color scheme for this character. Metal armor should almost always be dry brushed, as it gives very good results. You will likely mess up your brush, so it’s a good idea to keep one brush you use only for dry brushing. We will revisit dry brushing later on. Now we move on the base coats. For the ranger, I decided to do the cape next, using a forest green color for the base. Squeeze some paint into your mixing tray, and add a couple drops of clean water (this is especially important for the cheaper craft store paints which are mixed very thick). I use plastic school-quality brushes which only cost a few cents a piece for mixing my paints with water, as they are all but disposable. Mix the paint and water together until you have a nice smooth texture. You want the paint to flow easily, but not run. It’s better to use multiple thin coats of paint than a single thick coat to show detail. Dip a good brush into the paint, until about half the bristles are covered. Remove, swipe excess off onto a napkin or even your mixing tray, then begin. Use long, smooth strokes as much as possible. Remember, you want even coverage, so don’t glob the paint on too thick. Spread it out like a thin coating. It’s a good idea to leave some areas of black primer showing as shadows. On the ranger, there are some deep folds in the cape that I left unpainted in this way. On the underside of the cloak, I used fewer coats, and only painted the areas closer to the edges. These dark areas make the mini look more realistic. At this stage, I decided to highlight the cape. You don’t always need to highlight, especially if you plan to use a wash, but in this case, I wanted to go ahead and do it. Capes are very easy to highlight, and show good results. I simply chose a brighter shade of green, more grass-like, and used the same dry brush method as before. Instead of dry-brushing the entire cloak, though, I simply did the edges and tops of the folds. The brighter paint in these areas will make the cloak look more realistic, as if light is reflecting off the surface. While the brighter green paint was mixed, I painted the ranger’s bracers to make her more interesting visually. I didn’t dry brush on the bracers, instead base coating them like I did the cloak. A base coat of dark brown on the boots and belt helped to break up the armor a bit. The next part was the toughest: the ranger’s skin. Since I will be using a brown wash later, I used a lighter skin tone than I normally would. She looks almost undead, I know, but the tone will be quite a bit less garish after the wash is applied. I used the smallest brush I had, mixed the paint and water very thin, and only dipped the tip of the brush in the paint. The key with this sort of thing is to go slowly, and do multiple coats. You will inevitably get some of this color where it shouldn’t be. That’s ok, once the wash is on, many of these errors will be hidden, and we can fix the worst later. I like to leave a bit of black in between one color of paint and the next, as you can see on the tops of the bracers. It’s another way to help prevent errors. I used a metallic color next, in this case, P3 Pig Iron from my local game store. I base coated the swords, blades first in a heavier coat, then just a dab on the hilt and pommel. The transition from hand to sword isn’t very clean, but that’s acceptable, since the wash will really help tidy up areas like these. After some consideration, I decided to help break up the darkness of the color scheme with some careful dry brushing of this same color on the rangers mail tunic. The larger scales on the legs in copper contrast nicely with the steely surface of the tunic. P ainting hair is difficult. I touched up the over-brushed green, copper, and flesh errors in the hair with black paint. For any type of brown, gray, or even red hair, I use a black base. For the ranger, to keep it simple, I dry brushed a bit of burgundy red just to show some highlights. It’s a little too red now, but when covered in brown ink, it will look more natural. The end result should be a dark, almost black color or hair. If you plan to paint blonde, I recommend a basecoat of brown. Yellow paint over black takes on a greenish tint that looks anything but blonde. Dry brushing is definitely the way to go for hair. Finally, the hard part is done. You may be a bit disappointed in your miniature at this point. There will likely be small mistakes, lack of detail in the face and hands, and many more things that bug you. That’s okay! 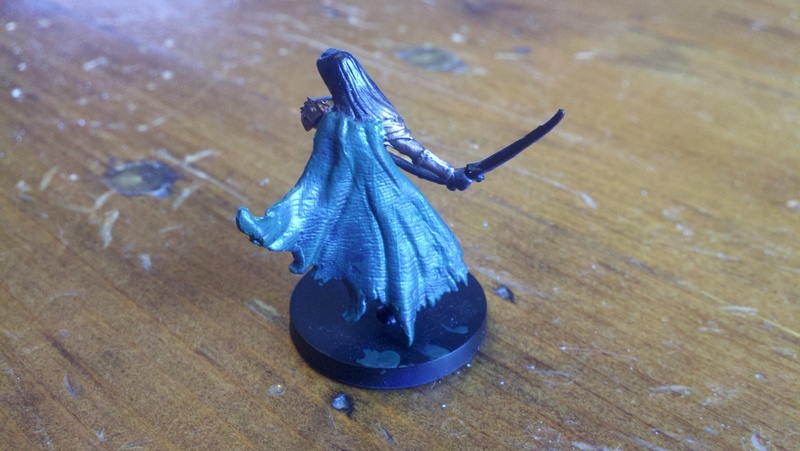 You are very close to having a great looking mini with just two more steps: an ink wash, and a spray of dullcote. Once these two things are done, your mini will look much, much nicer on the table. 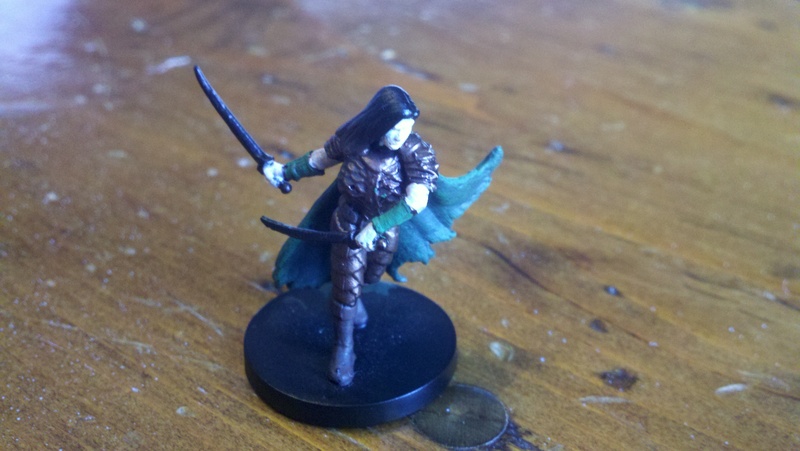 In the final portion of this series, we’ll go over these two steps in depth, and give some more general advice for getting your D&D minis looking great.